Talking about earwax may not make for good dinner conversation, but this bodily secretion that also goes by the name cerumen is vital to your hearing health. Earwax is there to protect your hearing, and knowing how it works can help prevent hearing loss. Earwax is created in the outer part of the ear, not deeper inside, and it is made up of skin cells, oils, and other particulates. It moves toward leaving the ear as people chew, move their jaws, and as new skin grows out. Earwax is sticky, so it stops things like dirt and harmful bacteria from reaching the inner ear. You would be at a much greater risk of problems like infections due to foreign substances reaching the ear canal without it. Depending on their ancestry, people have either wet or dry ear wax. People of Native American, Asian, or Pacific Island descent tend to have dry earwax, while people of Caucasian or African descent tend to have wet earwax. Diet, age, and environment also play roles. Like skin on other parts of the body, the skin of the outer ear flakes. Earwax stops your outer ear from becoming itchy and flaky, thus helping to prevent irritation and infections. Nobody likes the feeling of a bug in their ear, but it would happen more often if it weren’t for earwax. Insects don’t like the smell of cerumen, and those that do make it inside your ear get trapped on the sticky substance before they can make it further into the ear canal. Everyday activities like chewing and talking usually force earwax further out of your ear where it flakes off on its own. It is important to note that bad hygiene or diet can interfere with this process, which can then lead to infections or problems such as hearing loss. 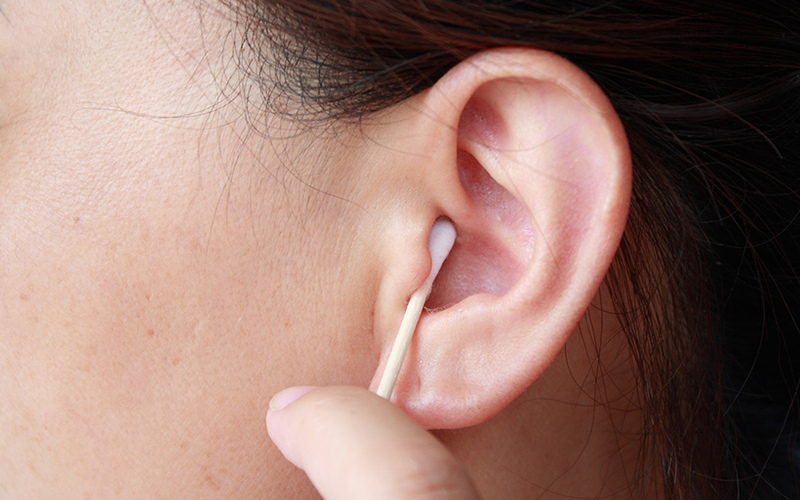 When people use cotton swabs to clean their ears, they might actually push earwax further into the ear canal where it doesn’t belong. This can also happen due to the use of earbuds or cleaning the ears with bobby pins or other items. Earwax impaction can lead to infections, ringing in the ears, and in the worst cases, hearing loss. Some companies sell candles that fit in the ear, with the claim that burning these candles helps naturally pull out earwax. These candles are not only ineffective, but they can also lead to dangerous effects such as burns or perforation of the eardrum. Excessive earwax will usually leave the body if you let warm shower water run into your ears, or use a warm dishcloth. For excessive ear wax, talk to your hearing healthcare professional about how to remove it safely. People who use in-ear hearing aids should talk to their audiologists about properly cleaning them to prevent wax buildup.